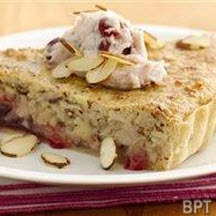 In 2013, Antoinette Leal of Ridgefield, Conn., won third prize at the contest for her Cherry Almond Brunch Tart recipe. Antoinette's winning recipe paired two popular flavors, almond and cherry, and used Eagle Brand® Sweetened Condensed Milk to create an extra creamy texture. Unroll pie crust; place in ungreased 10-inch tart pan with removable bottom. Press crust firmly against bottom and side of pan; trim excess crust. Bake 10 to 15 minutes or until crust is light golden brown. Meanwhile, reserve 1/4 cup of the almonds. Place remaining almonds in food processor. Cover; process until coarsely ground. In large bowl, beat sweetened condensed milk, butter, almond extract and 1/4 teaspoon salt on medium speed until creamy. Stir in ground nuts until well blended. Spread 3/4 cup of the preserves over bottom of partially baked crust. Carefully spread almond mixture over preserves, covering bottom of crust completely. Bake 20 to 30 minutes or until center is set and edges are golden brown. Remove to cooling rack; cool 15 minutes. Remove side of pan; cool 30 minutes. In small bowl, mix mascarpone cheese and remaining 1/4 cup preserves until well blended. Top individual servings of tart with mascarpone mixture and reserved 1/4 cup almonds. Serve warm or cool. Nutritional Information Per Serving (1/8 of recipe): Calories: 870; Calories from Fat: 490; Total Fat: 55g; Saturated Fat: 21g; Trans Fat: 1g; Cholesterol: 80mg; Sodium: 280mg; Total Carbohydrate: 78g; Dietary Fiber: 5g; Sugars: 29g; Protein: 15g. Recipe and photograph provided by www.BakeOff.com via Brandpoint Content; Copyright 1996-2014.